This large, straight-trunked rainforest tree has smooth grey bark, with long vertical fissures.. Young shoots and terminal buds densely clothed in cream or brown hairs, many of which are stellate. Leaves simple and alternate, broad, slightly hairy, about 11-40 long x 7-30 cm wide. Two conspicuous green or black glands occur on the petiole, near its junction with the leaf blade. Midrib and about four lateral veins radiate from the point of attachment of the petiole. The white flowers are produced at the same time as the prominently coloured (pink to reddish) new leaves, greatly enhancing the visual appeal of the flowering tree. Fruits usually depressed-globular, brownish in appearance, about 7-8 cm diameter, 3- or 4-lobed or rarely, or reduced to one or two, with one woody seed per lobe. 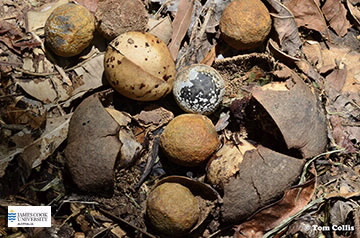 The rat-eaten remains of the hard, spherical seed coats (about 2 cm across) are normally present under large trees. JCU acknowledges the Yirrganydji and Djabugay Peoples for sharing their Indigenous Knowledge and pay respect to the elders past and present. Known as Nga-pa-la. Fruits are roasted in the fire before being eaten. The tree used for treating fungal infections. Resin from the tree preserves fishing lines. Timber used for making tools”.